While hiking across the sand dunes on the Spirit Sands Trail in Spruce Woods Provincial Park in Manitoba, Canada during the summer months, some will find the blazing heat from the sun to be unbearable. Hikers should be fully prepared on hot summer days with lots of water, sunscreen and a hat and the trail should best be avoided around midday. On this particular day, the rays from the sun filter through the unique cloud formations while a colorful halo encircles the sun. The temperatures can climb to over 35 degrees celsius during the summer with the sand being as hot as fifty degrees. Rainbow around the sun as it blazes down on the Spirit Sands trail sand dunes, Spruce Woods Provincial Park, Manitoba, Canada. 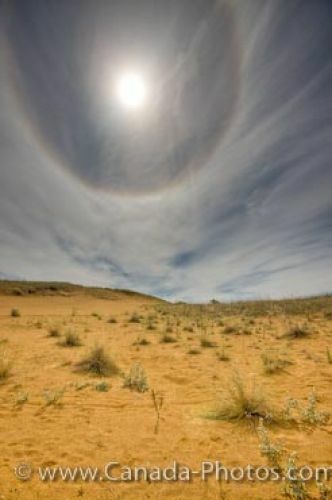 Picture of a halo around the summer sun beating down on the Spirit Sands Trail in Manitoba.